Solid deal at Target until the end of the week. Buy any two games on any platform (PS4, Xbox One and Switch) and get one additional game for free. Over 800 titles to choose from. Target is running a BOGO promotion! But before you get excited, it is only on select PS4 and Xbox One games. Most of these deals are under $20. This is a good deal if you're interested in any of these games: Doom, Resident Evil 7, Mortal Kombat X or Fallout 4. Solid deal at Target until the end of the week. Buy any two games on any platform (excludes Nintendo Switch) and get one additional game for free. Over 1300 titles to choose from. Looks like March is BOGO promotion galore as Target runs a site-wide Buy 1, Get 1 Video Game Free promotion. This sales event runs till March 11 and includes all major platform. Interestingly enough the top seller is Horizon Zero Dawn's price $120 CE. Its what you've been waiting for. Target Buy Two Games, Get 1 Free is now live until next Saturday. Choose from over 1,300 games across all major platforms. YMMV on a $5 off $50 coupon. REDCard holders gets another 5% off. Deal ends tomorrow! Target is running a promotion where if you buy two games, you'd get one of your choice free. Over 1,300 titles from all platforms are available including recent releases. Click through for more tips on how you can maximize this deal. Target's "Buy 2 Games, Get a 3rd Free" sale sorta heats up with PS4 games now available in the sale. They list 13, but unfortunately there's only four PS4 games that are actually in-stock to choose from :/... but still better than buying separately: Call of Duty: Ghosts, Killzone: Shadow Fall, Knack, and Just Dance 2014. Legend of Zelda: Majora's Mask 3D, Mario Kart 7, Super Smash Bros. and more in Best Buy's "Buy 1, Get 1 50% off" Nintendo 3DS sale. 42 titles available as of writing. Target is running a Nintendo 3DS BOGO sale this week, buy one 3DS game, grab the 2nd one for 50% off. There are 63 titles to choose from including Super Smash Bros, Pokemon Ultra Sun & Moon, Bravely Second: End Layer, The Legend of Zelda: Majora's Mask 3D and more. Sure it only appears once in a blue moon, but you can now buy Wii U or 3DS games for cheap thanks to Best Buy's Buy 1, Get 1 40% off sale. Nintendo 3DS and DS games 2 for $30 today at Toys R Us. A list o 182 qualifying titles available. Animal Crossing: New Leaf and Sonic Rush just sold out. Can't go wrong with this deal if you spot something you fancy. Grab any two Nintnedo DS and 3DS games from a list of 100 and it'll be $30. Best Buy is running their popular Buy 1 Nintendo 3DS game sale, get 1 50% off deal. 39 titles available as of writing. Deal ends tonight so act fast if you're interested. Solid deal at Target until the end of the week. Buy any two games on any platform (excludes Nintendo Switch) and get another one 50% off. Over 1000 titles to choose from. Beyond the amiibo sale, Target is also running a Buy 1, Get 1 50% Off Sale. Applies to all major platform with over 400 titles available. Giant video game sale at Target on Xmas Day! 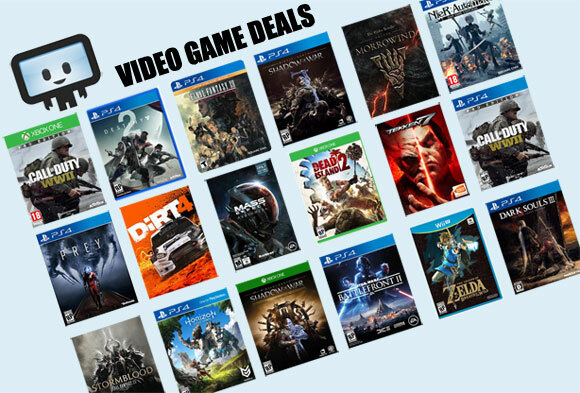 Buy 1 game, get another 40% off ALL video games. Online has a bit less selection but still over 340 available. Available both online and in-store. ALL games in-store qualify! Target is running a sale on Wii U games. Nearly 18 titles are included in a buy 1 get 1 free promotion. Titles in this deal include Super Smash Bros., Splatoon, Pokken Tournament, Paper Mario: Color Splash, Super Mario Maker, and The Legend of Zelda: Breath of the Wild. Best Buy has a great deal for Nintendo Switch gamers, especially if you have GCU (and you probably do if you're a Switch gamer). Buy Mario + Rabbids and you'll get $30 off when combining the purchase with another Switch title of your choice (out of 22 titles). With GCU, this is essentially getting you 40% off both games ($72 for two games). 22 Nintendo Switch games qualify for this offer. You're essentially getting 25% off both games in this deal. But for those with GCU, this is a very good offer to pick up as you'll be looking at about a 40% off discount. New video game sale at Best Buy. Buy select game (from choice of 28), get another for 50% off. Includes recent release such as Call of Duty: WWII, Destiny 2, Star Wars: Battlefront II, NBA 2K18, FIFA 18, Assassin's Creed: Origins. Best of all? GCU stackable discount. Best Buy is running a Buy 1, Get 1 50% off sale on select Xbox One games (6 titles only). Most of them are Xbox One exclusive titles such as Sunset Overrdrive and Halo 5, but there is Rise of Tomb Raider as well. Have GCU? Even better because each games are a further 20% off making for some even better savings. It's been a long time since we last saw a BOGO offer, but this week Best Buy is running a Buy One Get One 50% Off select Xbox One games. Many of these are older Xbox One titles, so you may have seen them cheaper previously as pre-owned etc. Stackable with GCU, which is the real advantage of these type of sales. Today Best Buy's running a "Buy one, Get a Second 50% off" sale on select Bandai Namco titles. Notable titles include Naruto Shippuden: Ultimate Ninja Storm 4, One Piece Burning Blood, Dragon Ball Xenoverse 2, Tales Of Berseria, and Sword Art Online: Hollow Realization. ToysRUs has up the ante and their popular BOGO sale is back, now with an extra 10% off. Previously a Buy 1 Get 1 40% off sale, now you can pick up Switch titles for Buy 1 Get 1 50% off. Includes all major releases. Over 800 items available. Works on latest releases such as Super Mario Odyssey, Call of Duty WWII and more. Includes all major platform. Discounted item must be of equal or lesser value to lowest priced item purchased. Cannot combine with additional offers. Tis the season for savings. Popular sale at ToysRUs is back. Buy One Video Game, Get One 40% Of this week. Best of all, includes latest Nintendo Switch titles such as Super Mario Odyssey! Select popular titles are already selling out so act quick. Popular Toys R Us "Buy 1, Get 1 40% Off" video game sale is back in action. Works on all major platform (except Switch). Includes new titles such as Legend of Zelda Breath of the Wild (Wii U) and Horizon Zero Dawn (PS4). It's back! Toys"R"Us sale promotion of buy 1, get 1 40% off all video games is available across all major platforms. Works on recent releases like Pokemon Sun/Moon across major consoles (PC gamers don't bother as TRU doesn't really stock PC games). Toys R Us is once again running a Buy 1, Get 1 40% off ALL video game sale across all major platforms (except for PC, for which they only have a handful of titles on sale). The sale extends to toys-to-life figures (amiibo etc) and all video game accessories too. I attempted get this deal and couldn't make it work. I called a local store, and they had no idea any sale was going on.